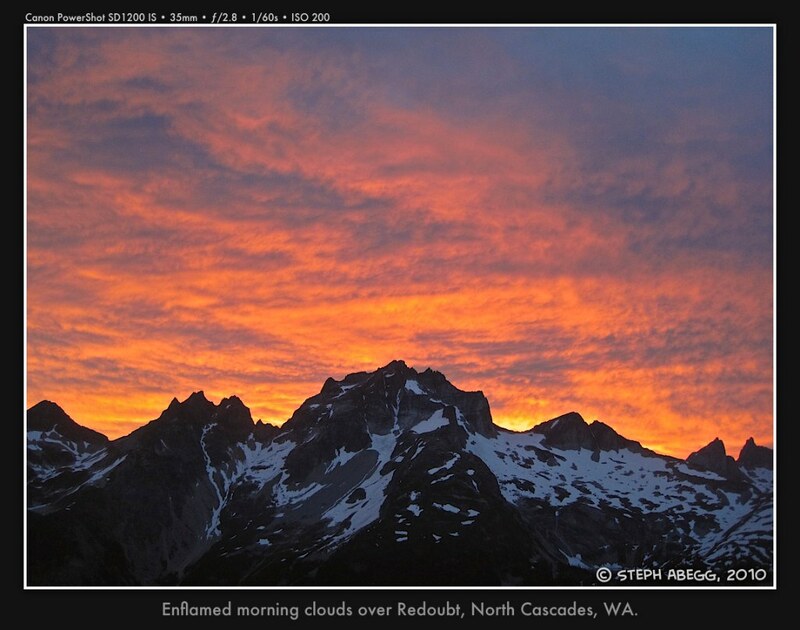 The last of Fred Beckey's big projects in the North Cascades. What a climb! -Bob Dylan, "Talking Bear Mountain Picnic Massacre Blues"
The left side of this page provides a trip report and lots of photos from the climb. 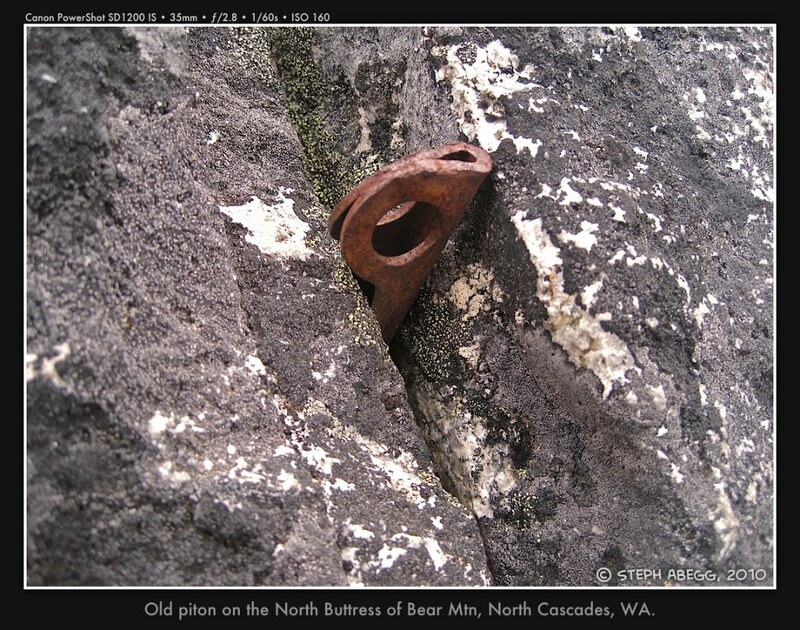 The original plan was to climb the NE buttress of Mt. Goode, but when the forecast didn't look Goode, Aaron and I tossed about some ideas for a worthy alternative climbing objective. Weather still looked decent further north. 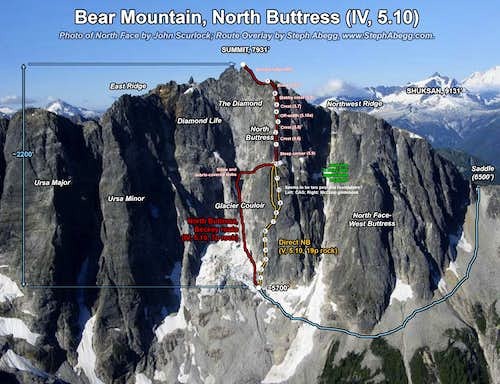 How about the impressive north buttress of Bear Mountain? 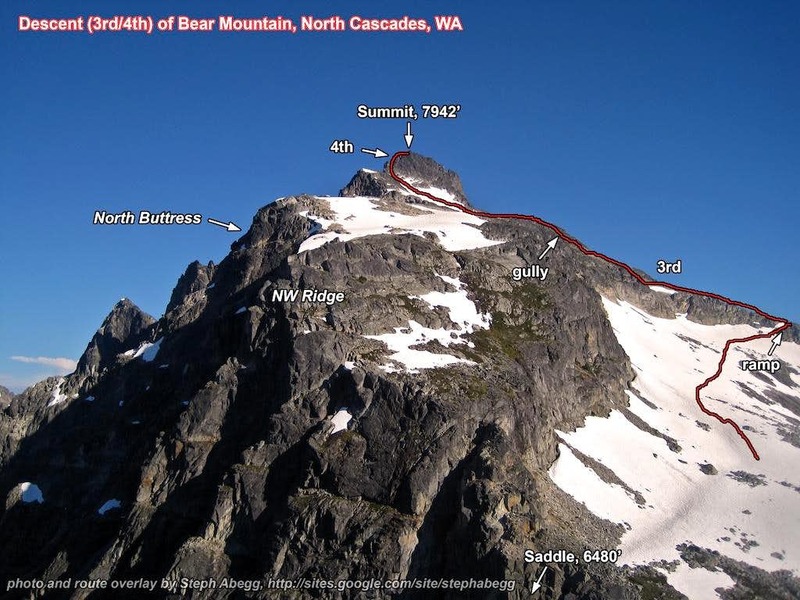 The 2000-ft steep north face of Bear has some of the best and most intimidating alpine rock climbing in the Cascades. 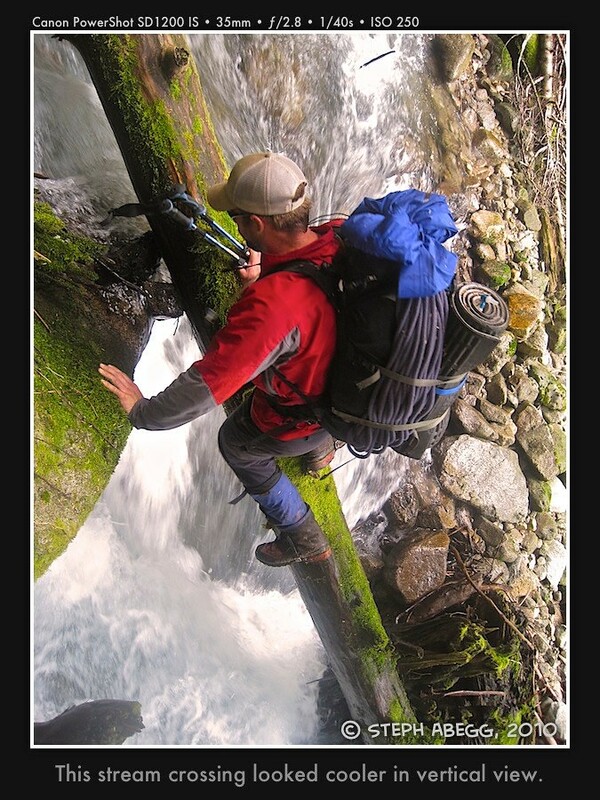 Better yet, getting there requires a passport and a strenuous bushwhack. Our initial goal was to climb the buttress via the direct route, but after some discussion at camp the night before the climb, we decided to use Beckey and Fielding's route to the upper buttress so that we could enjoy these stellar pitches without being pressed for time or tired out by the lower pitches. 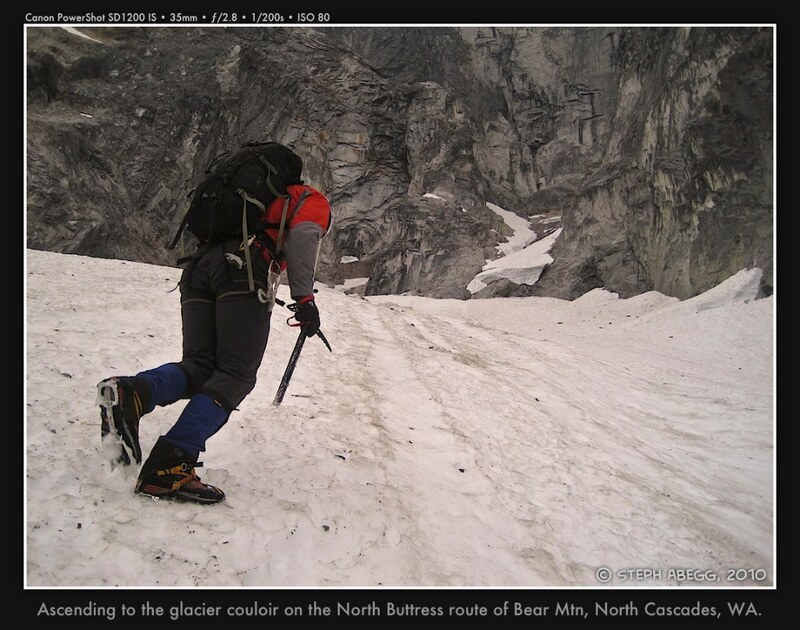 However, as we ascended the glacier couloir the next day, dodging falling rocks and traversing exposed pebble-strewn slabs, we looked longingly at the lower buttress, wishing we had not left our big cams back at basecamp. In retrospect, our decision to climb the quicker couloir was fortunate, as it began to rain just as we finished our climb and the rock became surprisingly slippery - we would not have wanted to climb the last few pitches of the upper buttress (particularly the slabby 5.9 pitch) in these conditions. I will be back someday to climb the DNB! Aaron and I had a great time on this climb. It was the first time I had climbed with Aaron, and I hope we can get together for some more climbing in the future. 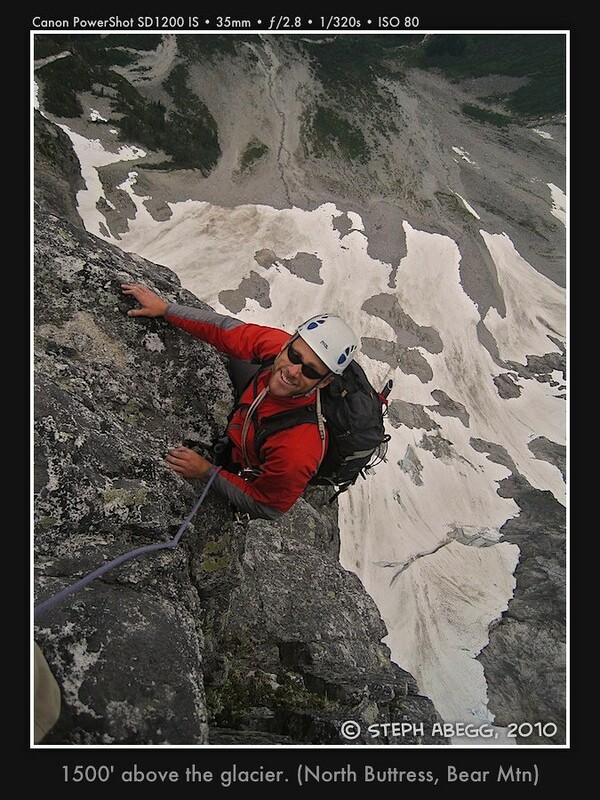 The climbing was some of the best I've encountered in Cascades alpine terrain. I think both of us are inspired to return some day to climb the direct route. 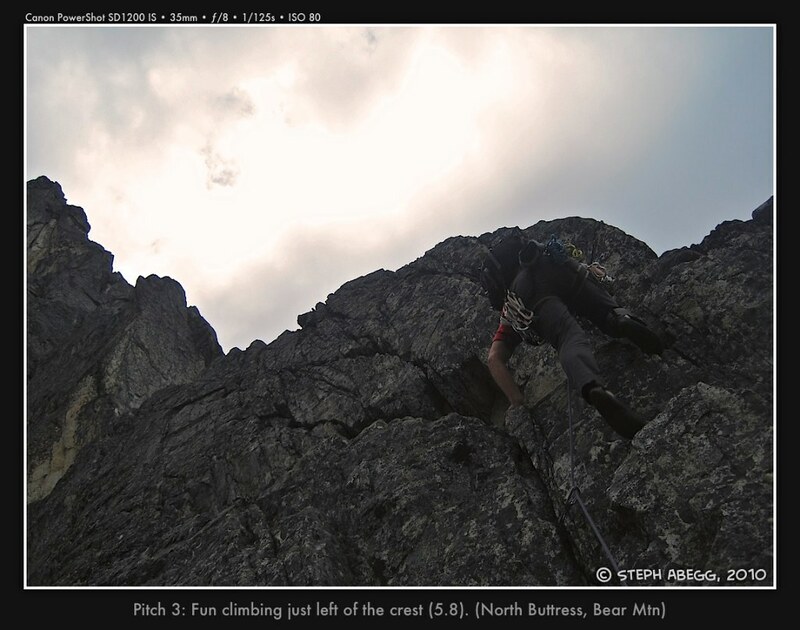 We joked that if I made my trip report really good, then perhaps enough people would go climb Bear and trample down a nice path through the grueling bushwhacky approach! Below is a pitch-by-pitch description (with photos of each pitch) of the amazing North Buttress of Bear Mtn. The trailhead is at the end of the Chilliwack Lake Road (accessed off HWY 1 east of Vancouver, BC). There is a gate and bridge here. Walk the final 1.5 miles of road to the south end of Chilliwack Lake and get on the Chilliwack River Trail. The trail is pretty good and well-flagged until it crosses the US border at around 1.7 miles. Then it becomes quite overgrown (hasn't been maintained since the 70's probably), and is at times nearly impossible to find. 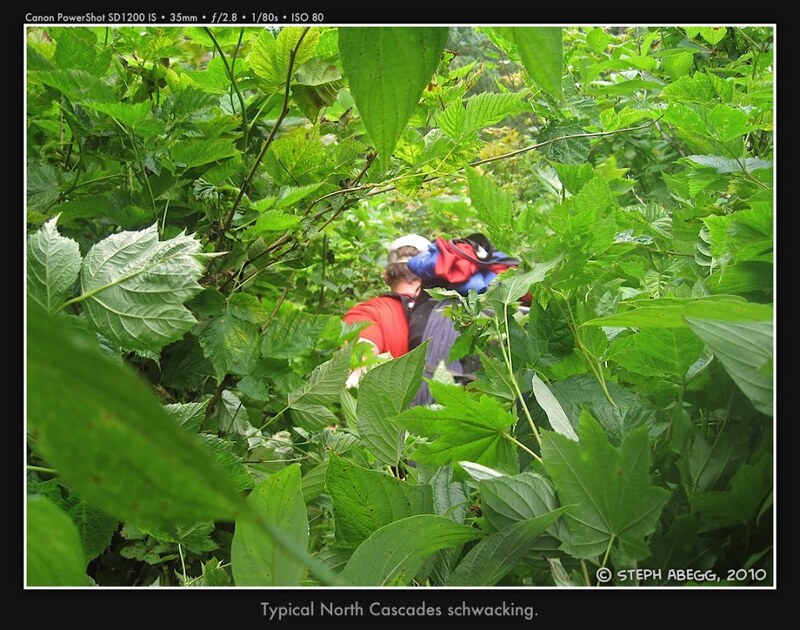 We often found ourselves shwacking through some pretty dense thickets. 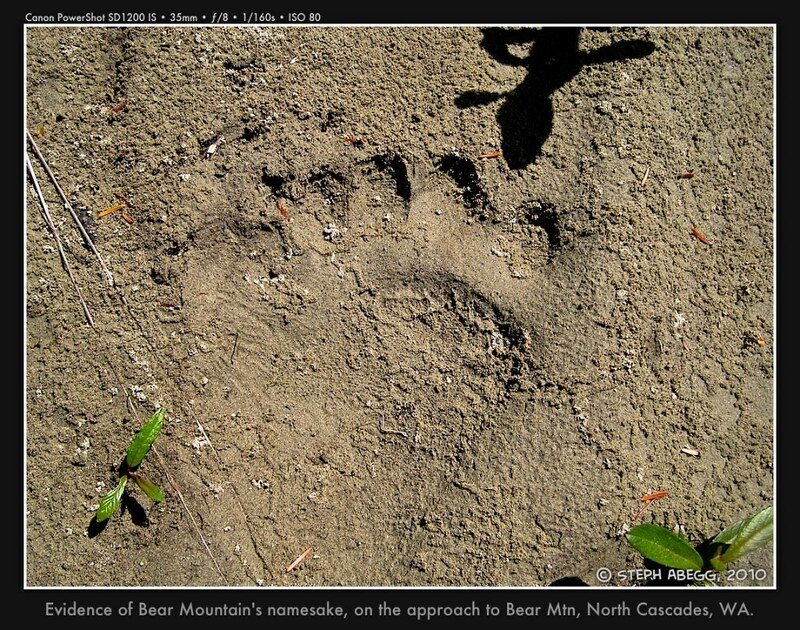 It took us 5 hours to get to Bear Creek, about 6 miles from the trailhead. 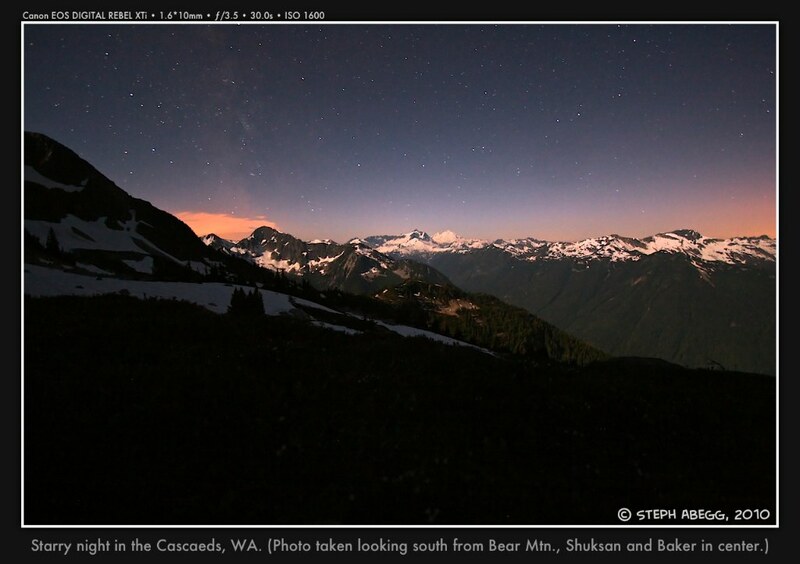 Just after crossing Bear Creek, ascend steep timber eastward. At the treeline climb through huckleberry bushes before coming to the meadowland above Ruta Lake. It took us 2.5 hours to get here. Continue along the divide, then traverse the south slopes around Points 6592 and 6822, crossing a rock rib to a saddle (6480'). 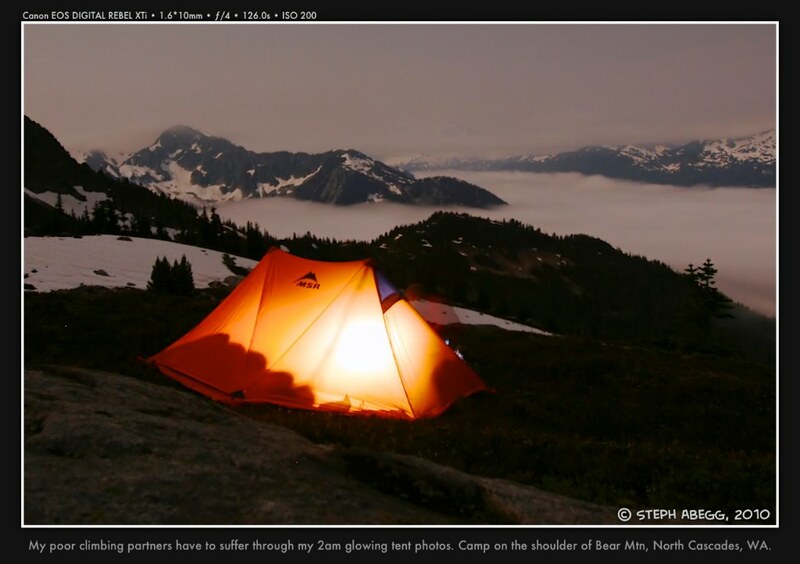 There is nice camping in this area. It took us 9 hours to get to here from the car. This approach definitely rivals any approach into the Picket Range. Descend snow/talus NE from the 6840' saddle to get below the North Face buttress at about 5500'. 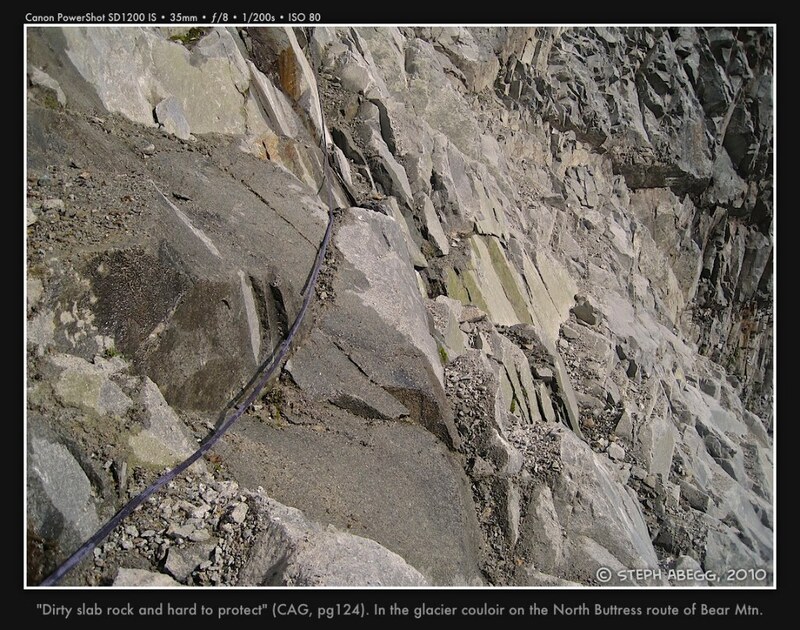 Traverse talus/snow to the base of the glacier couloir just left of the North Buttress (~5700'). Steep corner just left of crest. This was superb climbing. Perhaps it was our heavy packs, but Aaron and I felt this pitch deserves a nice little "+" tacked onto the rating. Fun climbing on the crest. 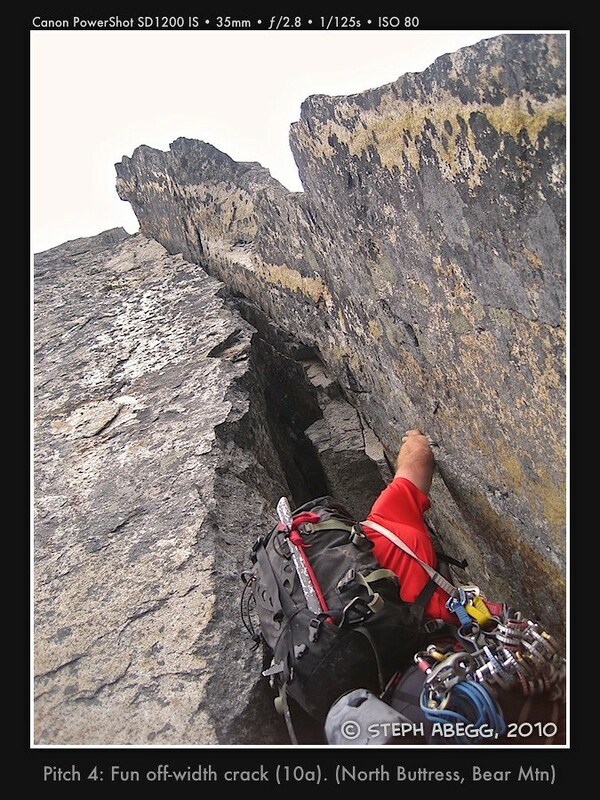 Steep rock left of crest (5.8) to a nice ledge below an off-width crack (1967 party bivied on this ledge). Blocks and cracks on the crest to below a steep step. 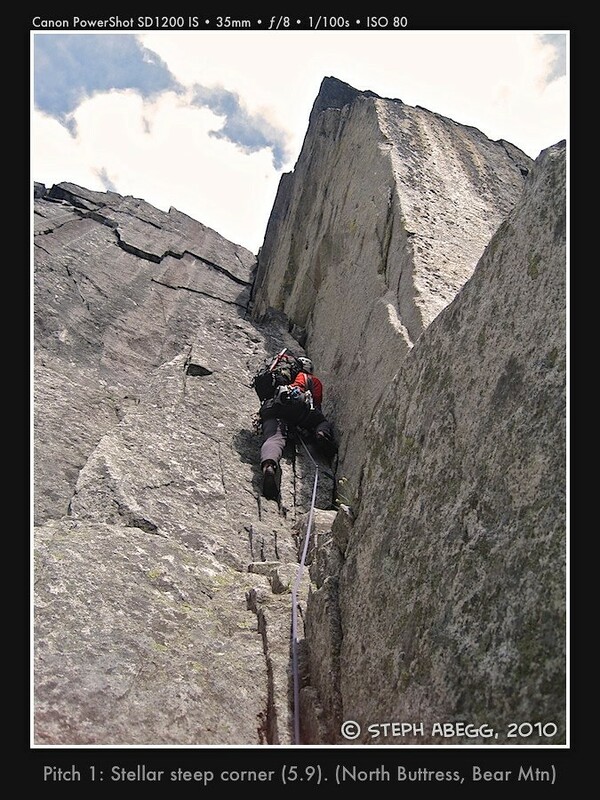 Blocky climbing to the top of the buttress. From here, it is a scramble to the summit. 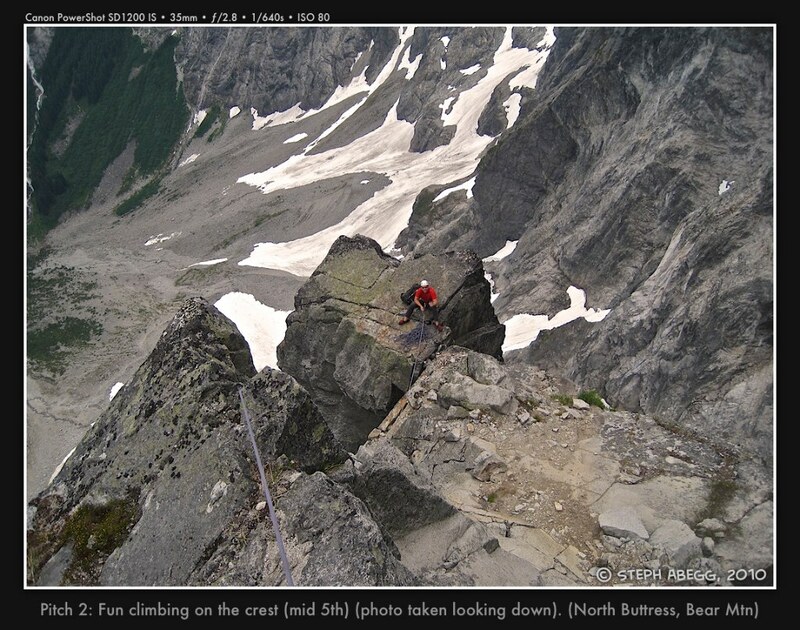 From the top of the north buttress, it is a short blocky scramble to the summit. It had started to rain, and the rock was a bit slippery, so we opted to simulclimb instead of solo. 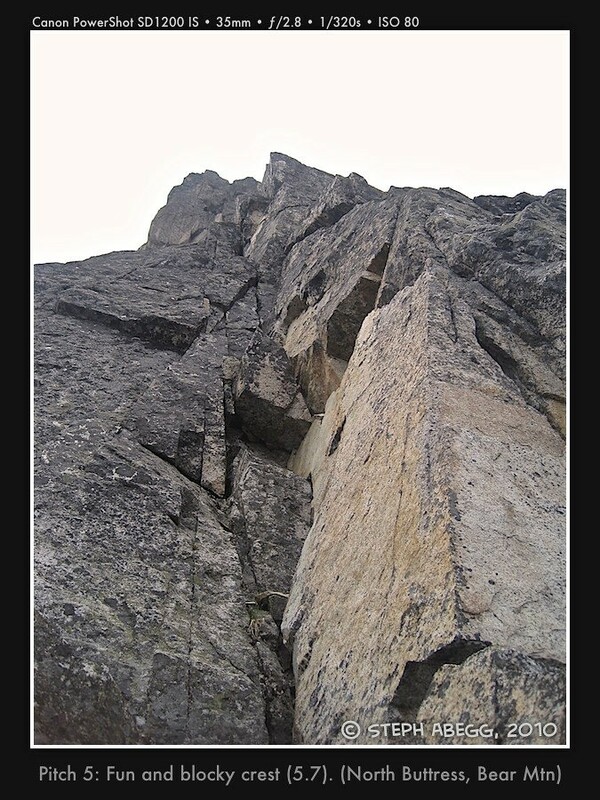 It took us 4.5 hours to climb the upper buttress to the summit. 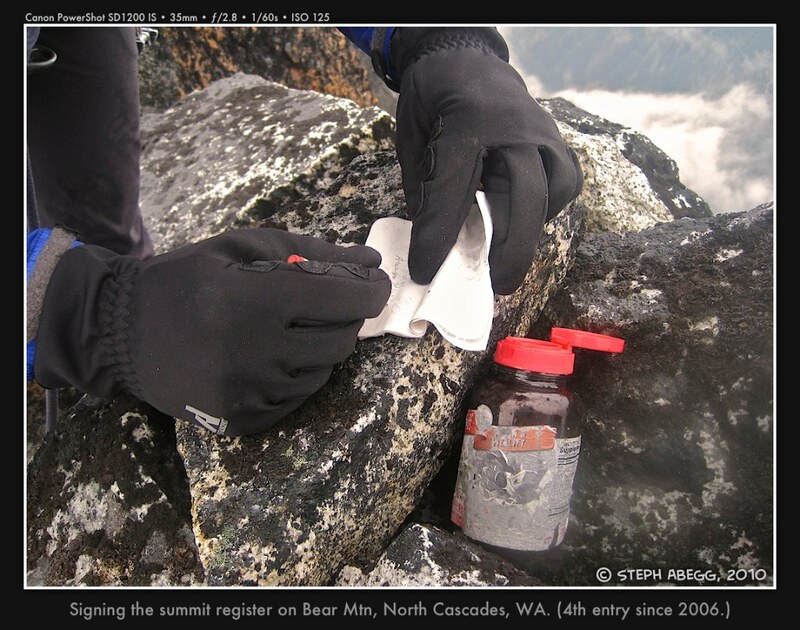 This summit doesn't see much traffic, but we discovered that 3 parties had signed the summit register since 2006. The descent is direct and straightforward, and took us about 1 hour. From the summit, descend westward, keeping on the south side of the ridge. 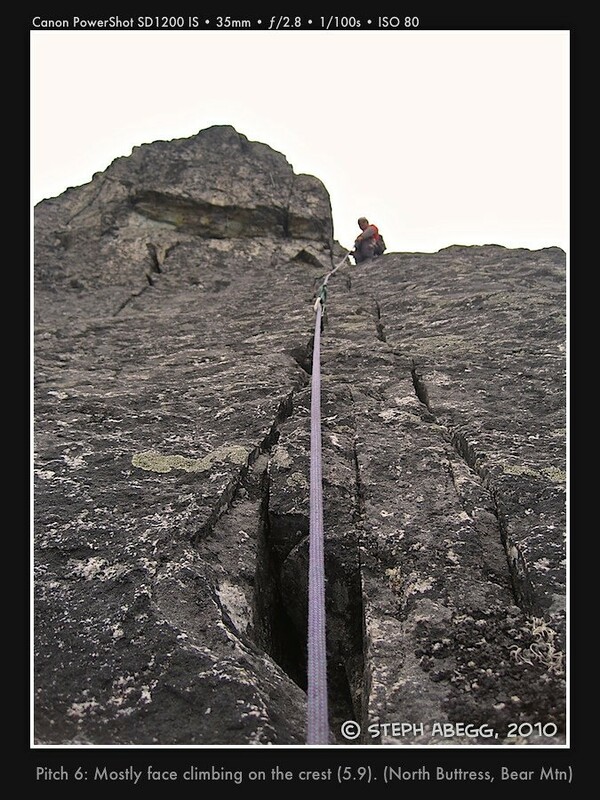 Stay left until able to down-climb a short 3rd class rock gully leading north and back to camp. We camped in a meadowy area below the saddle on the NW Ridge, at around 6400'. 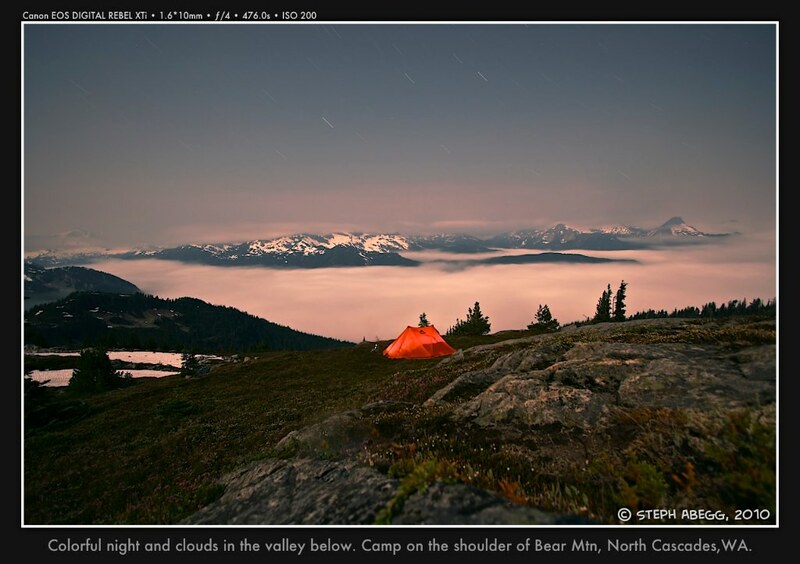 It was a beautiful spot, where running water, soft heather, twinkling stars, and bloodthirsty mosquitoes abounded. The right side of this page provides a general overview and photo overlays for the route, as well as our trip itinerary. 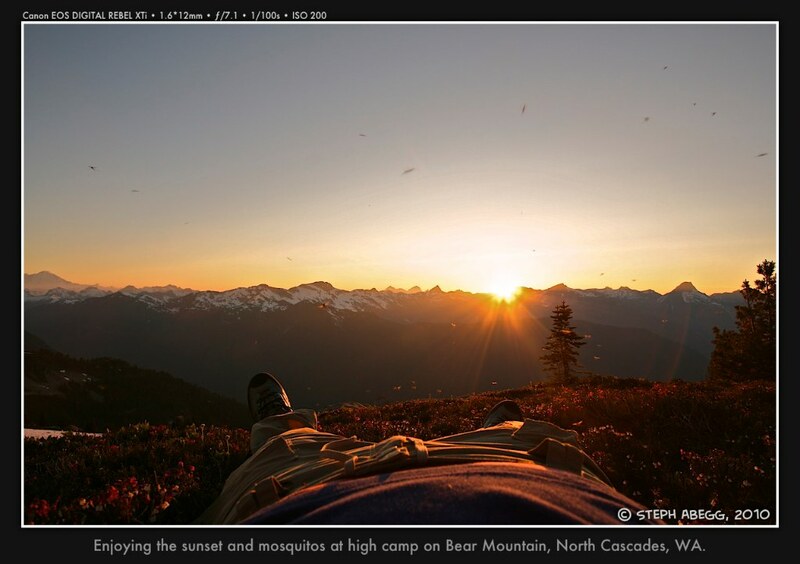 Leave Seattle at 4AM, drive north into Canada, and park at the Chilliwack River TH (2000') on Chilliwack Lake (BC). Start hiking at around 8:30am. Shwack south across the border along the Chilliwack River "Trail" to Bear Creek Camp (2300'), 5 hours. Ascend the Bear Creek High Route (no trail) to camp at saddle (6480') on the NW Ridge of Bear, 4 hours. 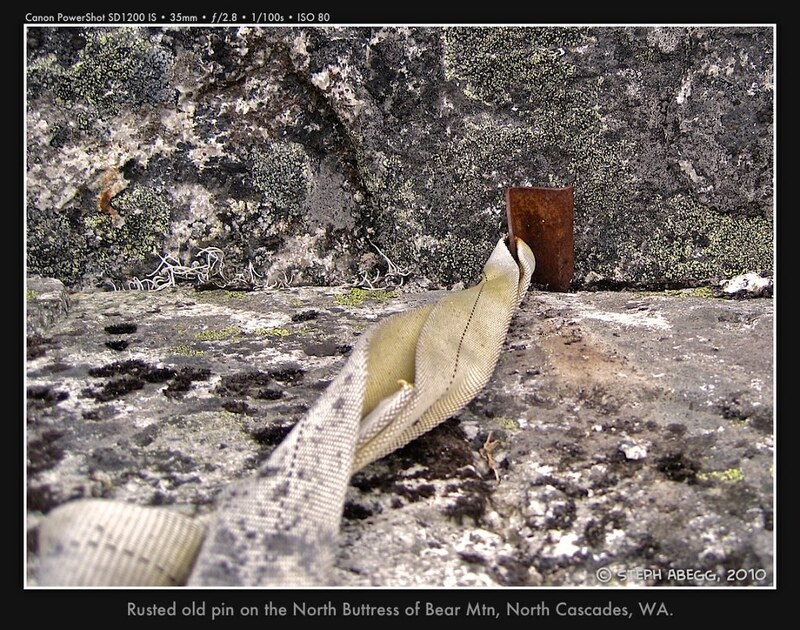 Leave camp and descend gully to toe of North Buttress, 1.5 hours. 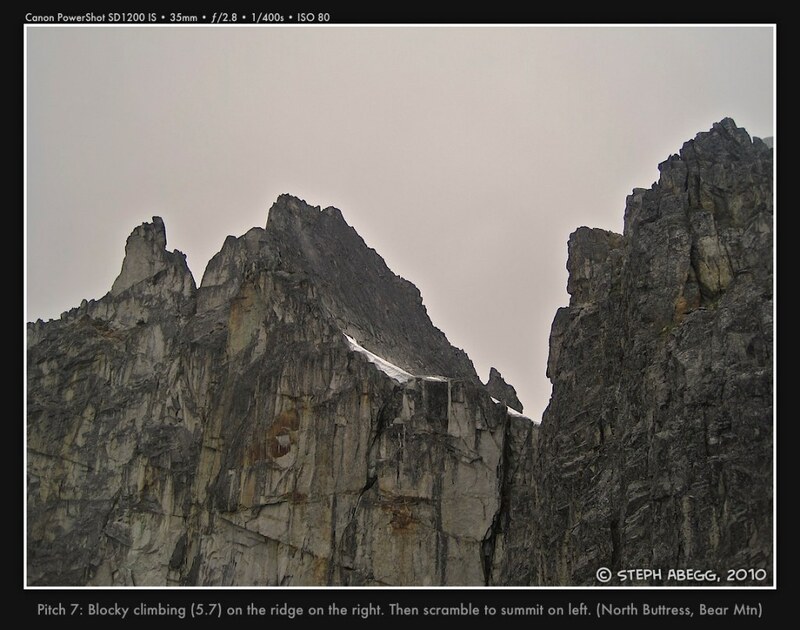 Climb North Buttress route to summit, 8 hours. 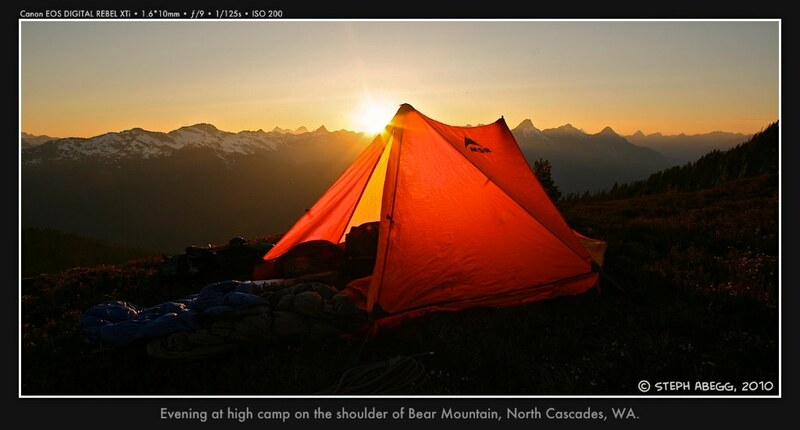 Descend to camp, 1 hour. 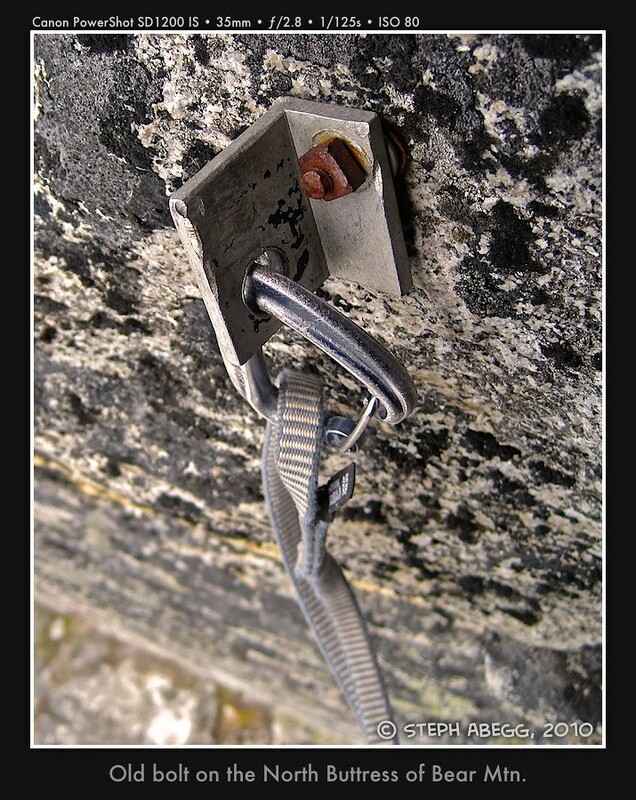 Note 1: Some climbers have been known to climb and hike out in one LONG day to make this a 2 day adventure. 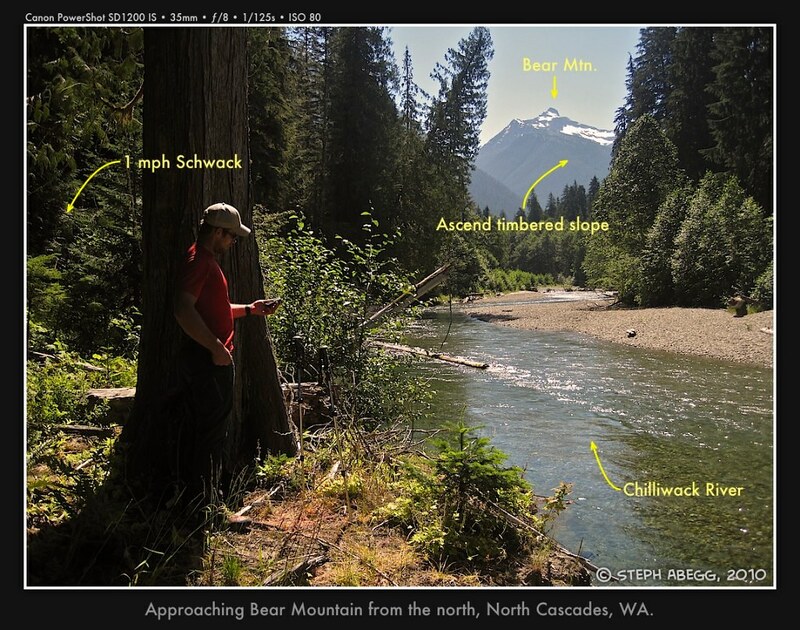 Note 2: It is also possible to access the Chilliwack River Trail from the south (via Hannegan Pass) but this adds significantly to the approach distance.